The term dizziness can be used to describe feeling faint, light-headed, unsteady or weak. It is often accompanied by the sensation that one's surroundings are spinning, and may cause nausea or vomiting. Throughout puberty, pregnancy, postpartum (including breastfeeding) and menopause, major hormonal changes are occurring, which can sometimes cause dizziness. 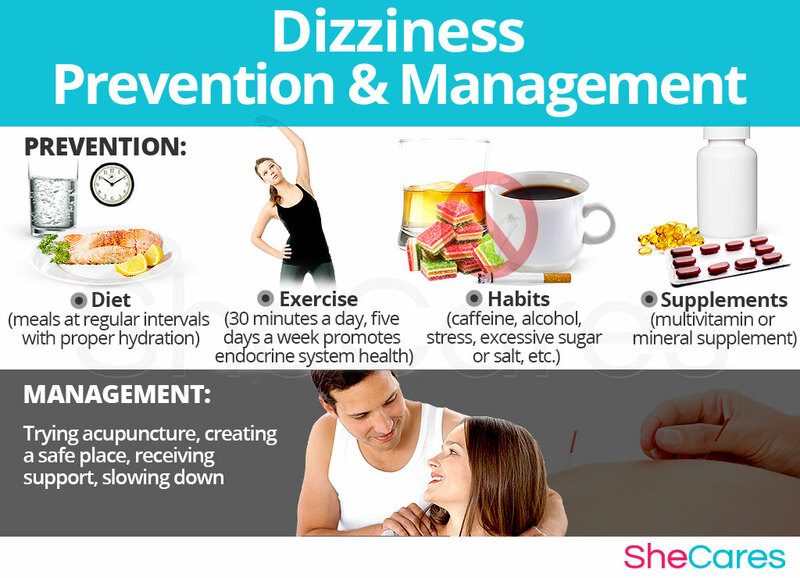 Fortunately, there are many things that a woman can do in order to decrease the effects of dizziness in her life. Continue reading to learn about the causes, risk factors, symptoms, signs, prevention and treatment options for dizziness. Feelings of weakness, nausea, confusion and loss of balance often accompany dizziness. People who experience frequent spells of dizziness may struggle to deal with this persistent interruption. Though generally not life-threatening, dizziness can be the symptom of another medical condition. It's important to listen to the body and slow down when experiencing dizziness, because this condition can lead to falls or fainting. Symptoms vary from person to person, ranging from occasional, mild dizzy spells, to severe frequent episodes. Dizziness is common during certain reproductive stages in a woman's life, such as during puberty, pregnancy, postpartum - including breastfeeding - and menopause. Dizzy spells also affect people differently, and some will be able to recover quickly, while others will take longer to recover, or in extreme cases, find it impossible to carry on with their daily activities. Dizziness is a subjective term in the medical field, as it can mean different things to different people, and is difficult to measure. In general terms, dizziness can be broken down into three distinct categories; vertigo, disequilibrium, and presyncope. Keep reading to learn more about the causes of dizziness. It is often possible to alleviate both headaches and dizziness with the same actions. Doctors recommend drinking more water - hydration is extremely important for maintaining a well-functioning body. Also, taking rest is invaluable - whether this is in the form of an extra hours sleep, or merely relaxing for a short time. Dizziness is generally the symptom of hormonal imbalance, which is commonly experienced in women during the stages of puberty, pregnancy, postpartum, and menopause. Though hormonal imbalance is the main cause of dizziness, other issues, like motion sickness, or low blood sugar can also be causes. As noted, dizziness can sometimes be caused by hormonal changes. Read on to discover the hormonal cause of dizziness. Hormones are chemical messengers responsible for the regulation of bodily fluids including growth, brain function and sexual reproduction. A shift in the balance of certain hormones can cause side effects, including dizziness. Estrogen. Throughout puberty, pregnancy, postpartum and menopause, fluctuations in estrogen levels occur in a woman's body, which can sometimes cause dizziness. Progesterone. When present in the body in excessive amounts, progesterone has been known to cause extreme dizziness and faintness. Lifestyle changes or the use of supplements may be necessary in order to decrease the effects of dizziness caused by hormonal imbalance. Prior to implementing such changes, it's crucial to find out about the cause of dizziness. Hormonal imbalance is one of the main causes of dizziness throughout a woman's reproductive life, though the fluctuation of hormone levels during each stage varies. (For example, the cause of dizziness during menopause is different than that during pregnancy). There are also specific hormonal causes that vary with every stage of a women's reproductive life in which this disorder appears. These hormonal causes and other factors can influence a woman's experience of dizziness, as is evident during puberty, pregnancy, post-partum, and menopause. Puberty is the stage when a girl's body starts producing reproductive hormones; these and other factors, such as poor diet and alcohol consumption, may cause dizziness at this time. Pregnancy leads to extreme changes in the production of reproductive hormones, which along with other factors, like fatigue or bodily changes, can lead to dizziness. Postpartum and breastfeeding is another stage when reproductive hormones are imbalanced, leading to symptoms like dizziness. Also, other factors contribute to dizziness during postpartum, like postpartum depression. Menopause is the stage in a woman's life when production of reproductive hormones naturally declines, signaling the end of a woman's fertility. As well as hormonal causes, other factors add to the reasons for mood swings during menopause, including the experience of other symptoms of menopause. While hormonal imbalance is the most common cause of mood swings during a woman's life, dizziness may also be caused by other more rare underlying conditions. Other causes of dizziness that are not related to hormonal imbalance include: viral infections, Meniere's disease, low blood pressure, arthritis of the spine or neck, hyperventilation, as well as alcohol and drug abuse. Dizziness may occur as the result of hormonal imbalance during certain times in a woman's life, but it may also indicate a more serious condition. Keep reading to discover when to seek professional help for cases of dizziness relating to heart attack, stroke, carbon monoxide poisoning and seizures. 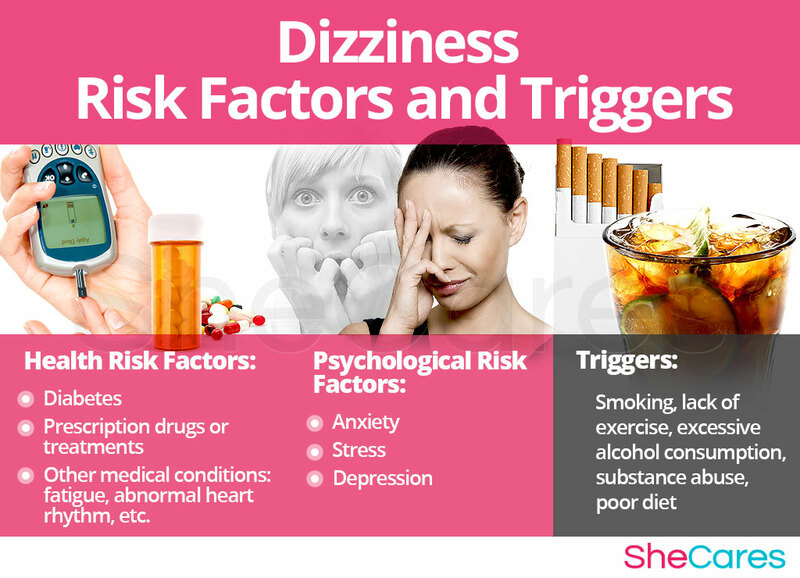 Although dizzy spells are commonly caused by hormonal imbalance, some women are more at risk of experiencing dizziness than others. Continue reading to learn more about the risk factors associated with dizziness. Some women are more susceptible to suffering from dizziness than others for different psychological, behavioral and health reasons. These factors can affect a woman's hormone levels and impact her chances of experiencing dizziness during her reproductive life. Diabetes. People with diabetes are unable to naturally produce the hormone insulin. Insulin helps to regulate glucose levels in the blood stream. Consequently, diabetics may experience dizziness when glucose levels in the body are too high or low. Prescription drugs or treatments, especially those used to control blood pressure, can cause dizziness. It is important for women to speak with their doctors about the potential side effects of any medication before taking it, and they should be sure to discuss any additional medications that they're taking, to ensure that one is prescribed a compatible combination. Other medical conditions. Extreme tiredness, chronic pain, abnormal heart rhythm, Meniere's disease and food allergies are possible causes of dizziness. Anxiety. Women suffering from anxiety often spend a disproportionate amount of time worrying, which can cause anxiety attacks. Anxiety attacks that cause hyperventilation can lead to dizzy spells. Stress. Women experiencing chronic stress may begin to hyperventilate also, which causes dizziness. Beyond the long-term risk factors, dizziness can also be triggered by other habits and environments. Avoiding these habits and controlling one's reactions to these environments can help to decrease dizziness symptoms. When choosing a treatment plan for dizziness, it's important to understand the signs and symptoms. 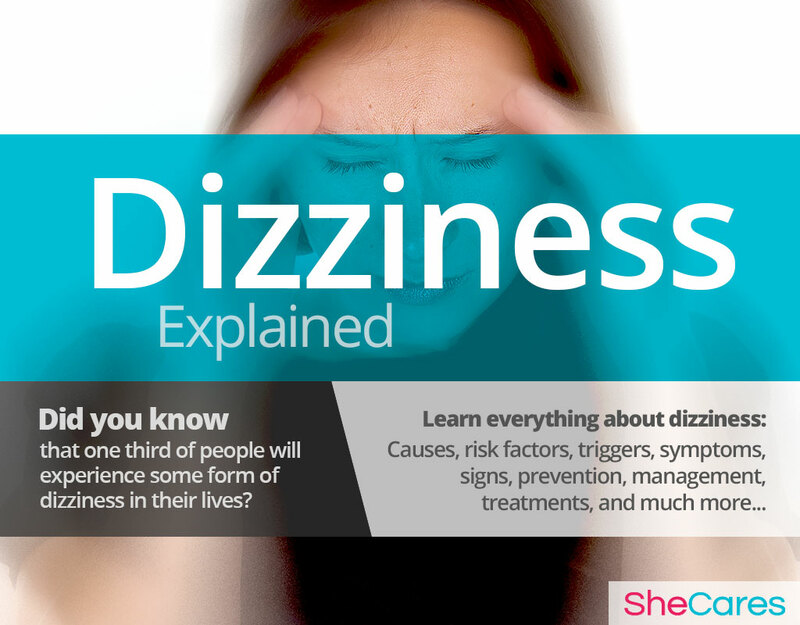 Continue reading to discover more about the signs and symptoms of dizziness in women. There are different medical signs and symptoms that can be useful in identifying dizziness. Keep reading to learn more about them, as well as what to expect during a doctor's visit. In addition to the physical symptoms of dizziness, there are also medical indicators that are not always obvious, and can be assessed by a doctor or healthcare professional. Estrogen levels. Estrogen can cause hormonal imbalances, particularly during puberty, pregnancy, postpartum and menopause. The inconsistent levels of estrogen in a woman's body during these periods may result in dizzy spells. Time and duration of symptoms. It may be helpful to monitor and record bouts of dizziness, including when it occurs, how often it occurs, as well as food consumed and stress levels that day. This may help to establish a pattern, such as dizziness occurring when a woman has had an excessive amount of caffeine, encountered a stressful situation at work, or during menstruation. For example, certain women experience morning dizziness quite often. If dizziness is unmanageable, or may be caused by something other than hormones, it is advised to consult a physician, who can perform tests in order to properly treat the individual case. Keep reading to learn more about dizziness diagnosis and tests. A doctor will perform three procedures in order to diagnose and identify dizziness. They will review the patient's medical history, and conduct a physical examination and a psychological evaluation. If necessary, additional tests will be conducted. Following the doctor's visit, further tests may be required. Continue reading to learn more about preventing and managing dizziness. Occasional bouts of dizziness are generally nothing to be concerned about, but in rare cases, it can be a sign of a serious health condition. Dizziness can cause vomiting, nausea, the inability to think clearly, and various other complications. It may take special exercises, alternative treatment or drugs in order to get a woman's dizzy spells under control enough for her to function. Women who experience dizziness need to be especially mindful about the physical space around them because of the possibility of falls or fainting, and should not drive or operate heavy machinery if there's a possibility that a dizzy spell will occur. 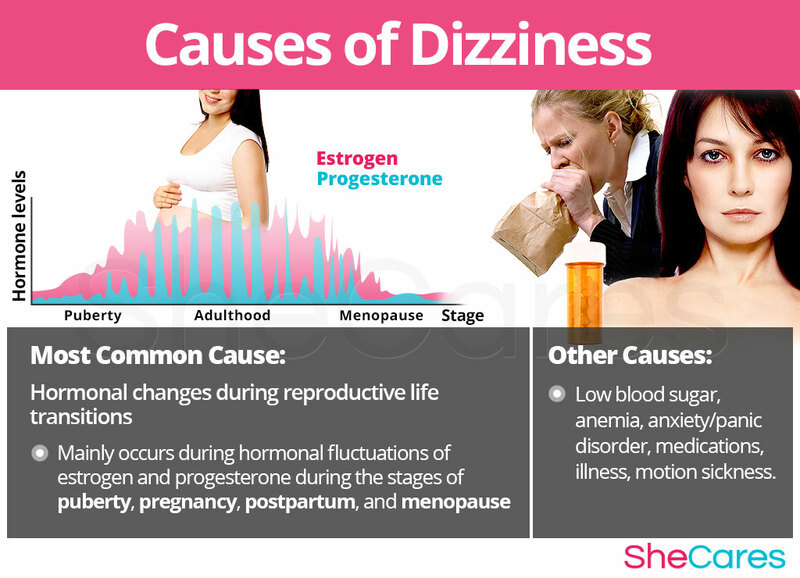 Mild cases of dizziness can be part of the hormonal changes associated with a woman's menstrual cycle. However, uncontrollable dizziness can severely affect a woman's quality of life. Some complications of dizziness include specific warning signs. Complications including unclear thinking, fatigue, loss of balance, migraines, facial numbness, eye pain, ringing in the ears and chest pain have all been linked to dizziness, which is why identifying the cause of dizziness is essential, as soon as possible. Keep reading to discover how to best prevent and manage dizziness. There are many behavioral changes someone suffering from dizzy spells can make in order to best prevent and handle dizziness. Diet, use of supplements, habits and exercise can be combined for optimum management. For women who are already experiencing dizziness, it may not be possible to prevent dizzy spells. On the plus side, there are many different ways that women can manage dizziness, and decrease the intensity of symptoms. Continue reading to learn how to manage dizziness. No matter where a woman is when she is experiencing dizziness, there are effective ways that she can best manage her condition. Making changes in daily routine and avoiding triggers can greatly impact a woman's experience of dizziness. There are many things that women can do in order to lessen the impact of dizziness on their lives, no matter where they are when a dizzy spell occurs. It is important to identify the root cause of dizziness, in order to find the best possible treatment. Continue reading to learn more about treatments for dizziness. Feelings of dizziness on occasion is unlikely to be a sign of any serious condition, but merely a consequence of your behavior and activities on any given day. However, if you feel this sensation increasingly, it is important that you consult your doctor because it could be a symptom of something more significant. The treatment for each individual case of dizziness depends on its cause. Although many minor cases of dizziness can recover on their own, it's important that recurring episodes of dizziness be treated, because this symptom can be the sign of a more serious medical condition. The three categories of dizziness treatments are (1) Lifestyle Changes, (2) Alternative Medicine and (3) Pharmaceutical Options. Women are encouraged to begin with the first line of treatments, lifestyle changes, which involve the least risks. Lifestyle changes can make a big difference in alleviating dizziness; however, they do not address the root cause of dizziness, which is hormonal imbalance. Fortunately, when coupled with alternative medicine, lifestyle changes can be an effective method of treating dizziness. Making lifestyle changes tends to be the least expensive and invasive form of treatment, but often involves the most self-discipline. Implementing a healthy diet, regular exercise and healthy habits can all make a difference in helping to alleviate dizziness. It may be helpful to keep a diary in order to track dizzy spells to check for trends. Include details such as the time that dizzy spells occur, how long they last, the activity preceding dizziness and any other relevant details. If lifestyle changes do not decrease the occurrence of, severity or intensity of dizziness, it may be helpful to incorporate alternative treatments into one's daily routine. Alternative medicines involve minimal risk, and can treat dizziness at the root of the problem, which is hormonal imbalance. There are two different types of alternative medicine; phytoestrogenic herbal supplements, and hormone-regulating herbal supplements. Phytoestrogenic herbal supplements, like black cohosh, ginkgo biloba and dong quai contain plant-based estrogens that can help relieve dizziness caused by hormonal imbalance. These herbs are not recommended for long-term use, because they may decrease the body's ability to produce estrogen naturally. Hormone-regulating herbal supplements (e.g. Macafem) are good natural supplements that can be used over a longer period of time, because they do not contain estrogen. Instead, Macafem nourishes the endocrine system and encourages the body to produce estrogen on its own. These supplements can be considered the safest and most natural way to treat the underlying hormonal imbalance behind mood swings, and can be taken throughout a woman's life, as they support the body's natural hormone production. 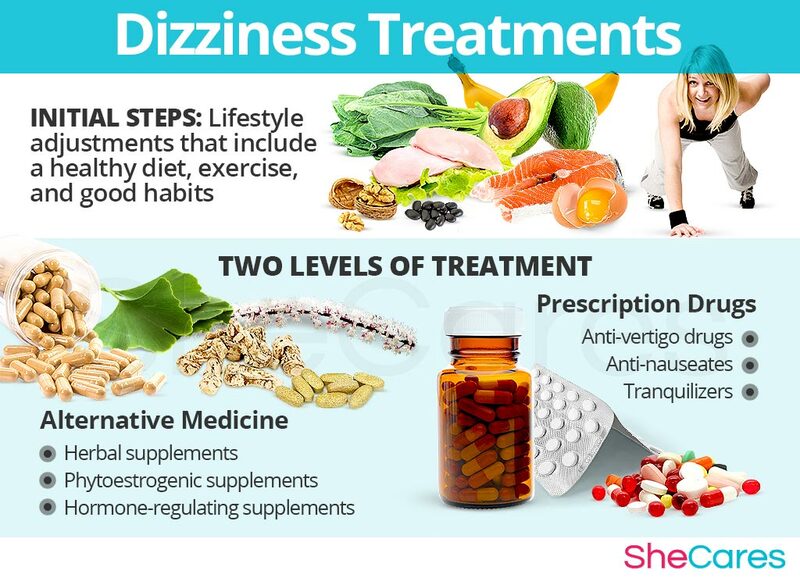 If changes in lifestyle and alternative treatments are not effective in providing relief from dizziness, it may be necessary to take medication to manage dizzy spells. Treatments at the third level involve the highest risks, and often the highest costs. Pharmaceutical treatments should only be considered if lifestyle changes combined with alternative medicine do not alleviate dizziness, and should always be used under the supervision of a physician. Depending on the cause of dizziness, different medications will be suggested for each individual. Anti-vertigo drugs, anti-nauseates, tranquillizers, antihistamines, and pain-relief drugs are all commonly used to treat dizziness. A combination of lifestyle changes, alternative treatments and drugs seems to be the most effective solution to extreme cases of dizziness. It is possible to experience side effects as the result of taking any drugs, whether they're administered via prescription or over the counter. It is recommended that all medication be taken under the advice and monitoring of a healthcare professional. These three approaches are not mutually exclusive. A woman may use different approaches at different times or any combination of them, depending on the duration and severity of symptoms. Today, it is becoming increasingly common for women to find that dealing with menopause symptoms is best accomplished through a combination of healthy lifestyle and alternative treatments.